Here we are car shopping. Bryan was test driving and I had the kids going crazy in the contained car. Such a blast. We got a free pop at Chick-Fil-A. Blake snuck it from me and I don't know how long she was drinking it, but then she told me her tummy hurt. Then she threw up while I was trying to get her outside. It was a new moment of motherhood - a friend handed me her baby wipes, then I got a sanitizer hand wipe and then Blake went back into the play place. Real mother of three here. Ha. Me: Blake, you can't go outside, you don't have pants on. Wade: I don't have pants on or a shirt on, can I got outside? Today we were at Target and Blake tripped, Wade and Jacqueline comforted her by giving her hugs and handing her their "treasures" - a shopkin and a coin. Oh, and they're all REALLY into coins right now. They've been earning them by helping out and they can put them in a jar - well, they're really good at finding coins everywhere we go, they're earning their keep. 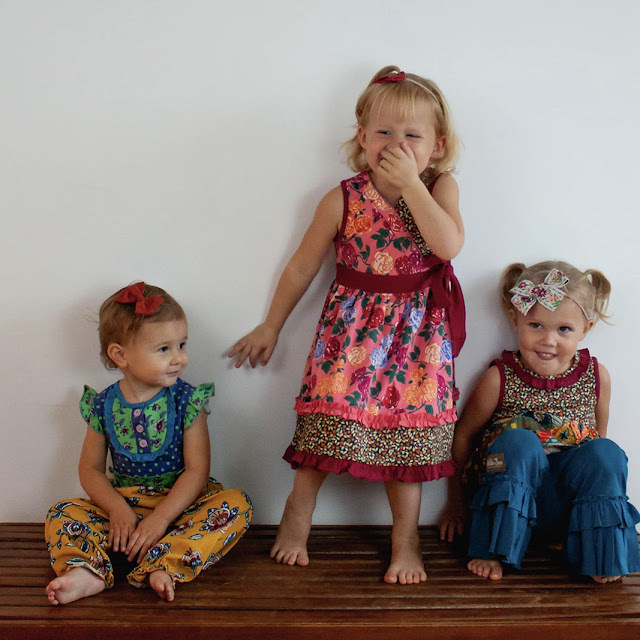 Did a photoshoot for a friend who started selling Matilda Jane clothing - I looked them up and they're kind of weird, but then I saw them on my kids and they're kinda cute. Not that it matters cause they're real expensive. Jac stole the show with her being her. Wade built a robot friend named tippo. Made with bubble wrap, colored pencils and a flashlight. He also made a "show." It included some magic and a disappearing act and prizes at the end!! He makes such good use of his quiet time. He also had the idea to make his sisters "blind bags" with Grossery Gangs and Shopkins and wrapping them in tin foil and tape. His sweet idea got him out of quiet time so I could help him. He was excited to show the girls when they woke up, and the girls were the perfect recipients. Blake snuck some time as Owlet. Snagged it a thrift store this week and Jac has dubbed it as hers (obviously, I'm quite certain she thinks everything in the world is hers), and then she's Jacqueline Owlet! Sometimes she baby Jacqueline Owlet, and I get in trouble when I call her the wrong thing. She wore it to the library and Wade made sure to tell everyone it was just Jacqueline, not the real Owlet. Occasionally Blake steals in and then pretends to be Jacqueline Owlet too. Wade snuck out of quiet time another time (he's clever) by asking Daddy if he could watch football with him, of course Daddy said yes. He made it five minutes, cause football is not as exciting as garbage. Blake keeps asking "cuddle me." It's the sweetest. Yesterday I laid next to her while she played with her Peppa's and then drifted off to sleep. Jacqueline falls right to sleep at nap time, Blake has to goof off a minute - opposite at bedtime. Wait, I need to end with the report that we finished First Nephi in the Book of Mormon! It took us the whole year up to this point. Bryan reads to them in Portuguese and I read to them in English, and we never figured out how to coordinate, so we've reread a lot...but we made it through! Maybe we'll be able to pick up the pace and finish by the time they're out of elementary school.